I do two, the new one and one of the old versions which I have topped out on. I like them better than some of the other games - some i don't do at all, for instance, Pinball Recall - that game is totally out of my range. Just started them (old and new)...took me a little while to get the hang of them, but yes, they are fun. I like the new version a lot more than the old one. I had gotten to the last level on the old version and couldn't beat it. The new one seems to be a lot more user friendly. I used to play this game a lot, but I've not touched it in probably 2 months. It's a good game, but I've think I am over it. I've been on the last level of the old Disillusion for a while, but still do it because it is challenging. In the new Disillusion I have gotten to 44 tiles, hope to improve on that! I like the game. its challenging. On level 9. I have a preference towards ' flexibility '. It took me a while to figure this game out. Flexibility is my weakest point by far. I like it because I am finally getting the hang of it. What the heck?! I remember when the piece is standing, I go by color. But I got confused and just started making sure I put the piece in the same direction, standing or sitting, and did just fine? I loved the Classic Disillusion on Lumosity, but I can't find it? Is it still available? The Classic Disillusion is still available on the Lumosity website. Hit the 'Games' tab at the top, then scroll all the way down to the 'Classics' section and you will find it. Does anyone still play the Lumosity Classic games? 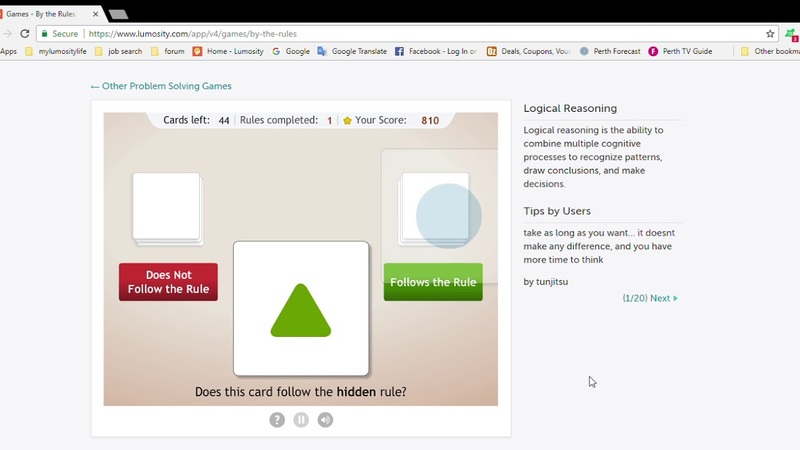 A full gameplay video of By The Rules, a classic Lumosity problem solving game. PRESS PLAY TO WATCH THE VIDEO.